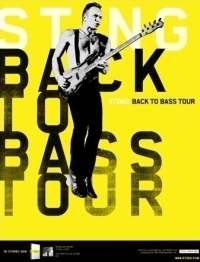 ''After spending the greater part of 2010 fronting a behemoth of an orchestra for his global 'Symphonicities' tour, Sting, ever the British heartthrob at 60 (not to mention a walking billboard for the benefits of yoga), has gone to the opposite extreme and pared things down to the bare necessities with his Back To Bass tour. Flanked by the father and son team of guitarists Dominic and Rufus Miller, Vinnie Colaiuta, the "drummer's drummer," as he tagged him, and the twin violin section of Jo Lawrie and Peter Tickell, Sting proceeded to take the adoring, largely 40-plus and 50-plus sold out crowd on a sonic adventure that revisited past triumphs and explore some lesser known gems of a catalogue that has sold over 100 million albums..."
Click here to read in full what the Toronto Star had to say about Sting's concert at Massey Hall. Were you there? Share your review or comments and post any photos from the evening or your ticket stub to the event page. Tell us about it! ''The day might have started off gloomy and cold, as a wintry mix descended upon DC, but for those who had tickets to Sting's Back To Bass show, the night was nothing short of magical. The sold-out performance was held at DAR Constitution Hall, which seemed the perfect venue for the performance that celebrates Sting's 25 years of music. Even before Sting and his five band members took the stage, the energy in the audience was apparent, as people chatted excitedly and took their seats...'' Click here to read what the Washington Examiner, The Washington Post and DCist had to say about Sting's concert at DAR Constitution Hall. Were you there? Share your review or comments and post any photos from the evening or your ticket stub to the event page. Tell us about it!